These are the Congregationalists – the traditional Puritan church. While generally weak today, they are nonetheless mostly confined to Yankeedom. These are modern Quakers. While, again, fairly weak today (having been, like the Congregationalists, subsumed by newer sects), they are strongest in the narrow band that makes up the Midlands. These are Presbyterians – the traditional church of the Scots. We see that it is relatively strong in the areas that received the Ulster Scots, across Greater Appalachia and parts of the Far West. This is the Episcopals, the modern derivatives of the Anglican Church. This group is perhaps the most divorced from its origins of the representative church of the Cavaliers of the lowland South (the Tidewater and the Deep South). It remains quite alive in the Tidewater area, however. These are the Baptists and Pentacostals, who have become the church of choice of the Tidewater, of the Deep South, and especially of Greater Appalachia. Indeed, Baptism links these three nations into their current alliance as the Dixie bloc. 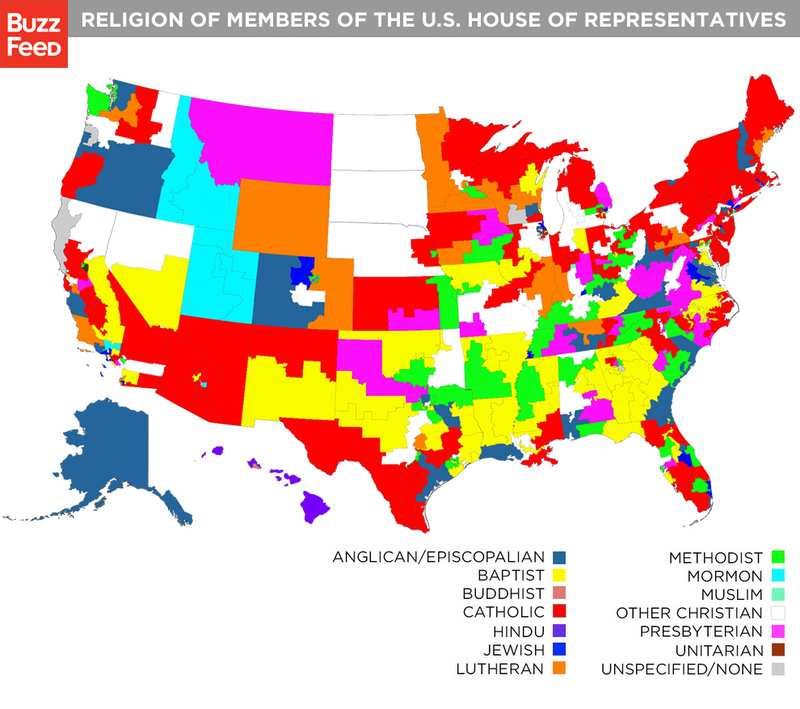 This is a map of the religious identification of the House Representatives from each congressional distinct. Certain patterns are evident: Presbyterians are largely confined to Greater Appalachia; Anglicans are most represented in the Tidewater/Deep South; the Midlands show a mix owing to its multicultural history. El Norte is dominated by Catholics. 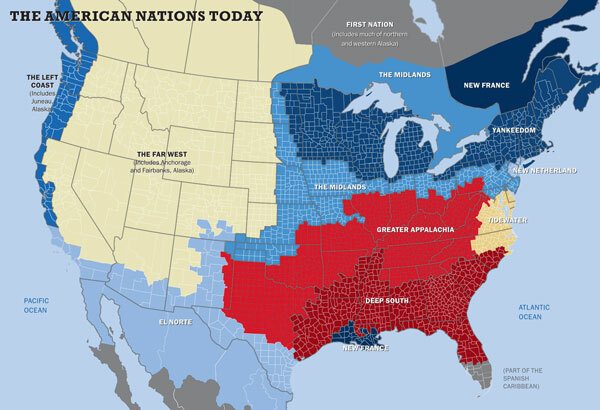 Today, Yankeedom has come to be dominated by Catholics thanks to the strong presence of Italians and Irish there (and the French in the northern sections). The Mormons are Puritans that, like their antecedents in England, went through a religious revival and became a type of rebel/outcast group. And like their Puritan ancestors, they migrated west and set up a stronghold across the Far West, particularly in their state of Utah – just as their Puritan ancestors did in New England. 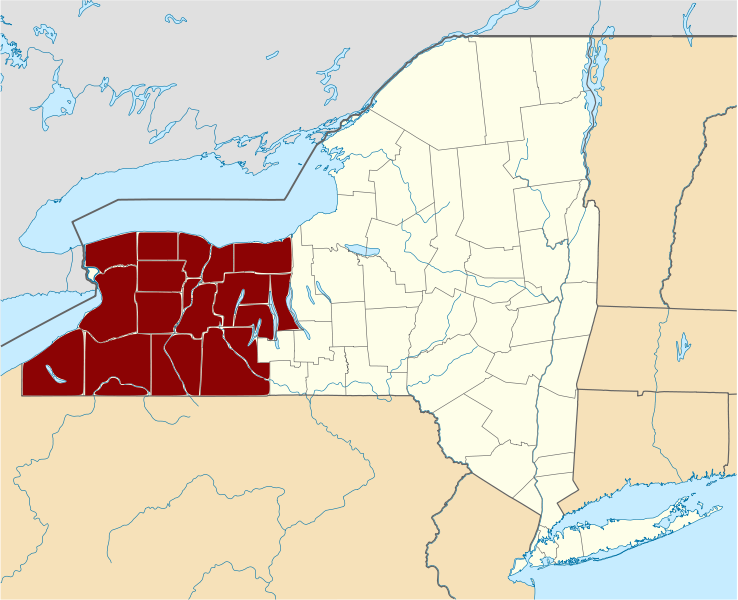 Indeed, a certain penchant for reformation/radical revival is a tradition in Yankeedom, as we see from a region of western New York State that’s been named the “burned-over district”. This is the region which spawned Mormonism, among other variously successful religious and other movements. This is a map of the percent of the people in each state who claim no religious affiliation. As we see, today, northern New England proper is the least religious area of the country, followed by its daughter areas across the Left Coast. Religion is a reflection of political, social, and cultural mentality and identity. This is because the primary purpose of religion is to establish group cohesion. New sects often rally around religious causes because it’s a powerful way of identifying one’s group and symbolizing one’s commitment to the group. We saw that with the groups that founded America, particularly the Puritans and the Quakers, and we see that with many of the subsequent movements that have come up across the country over the years. A group’s religious beliefs shed great insight into the (inherited) psychology of its adherents, and this is part of the reason that individual believers are drawn to their faith. Today, religion serves as one of the many markers of the American Nations. FWIW I went to a neighborhood pick-nick last night in an upper-middle-class suburb somewhere in Appalachia. I overheard private conversations about the Moody Bible Institute and there was a public prayer before we ate — and yet I was struck by how essentially moderate, peaceful, and, yes, intelligent these people were. Liberals up north just assume that people who still worship and talk about God must be uncivilized barbarians. How far from the truth. That should have been picnic, not pick-nick, and yes of course not all liberals think that way. But one generalization deserves another. Religion is also a matter of wealth, which might explain the slight but still existing difference in intelligence between believers and nonbelievers. I saw a documentary on how oil had drastically decreased religiosity in rural parts of Norway. The democratic socialist model really spread the wealth widely and suddenly no one went to church anymore. Although this effect is probably stronger in an outbred nation. In a more tribal/clannish nation the wealth is not going to be spread and the group cohesion function of religion will be stronger. Maps of the distribution of Catholics and Eastern Orthodox would be interesting, too. The Orthodox churches seem to be growing fairly rapidly. I’m afraid I don’t see it. I can see Mormons clustered around The Great Salt Lake and Lutherans clustered around Minnesota but the Congregationalists, Presbyterians, Pentecostals and all the others look to me to be sprinkled around randomly. There needs to be some kind of ‘null hypothesis’ for map interpretation. In a couple maps there is a big solid color showing something or other in Alaska. A single believer of some splinter sect can paint the whole North Shore of Alaska in color. Whereas thousands of others would make no impact in New York. 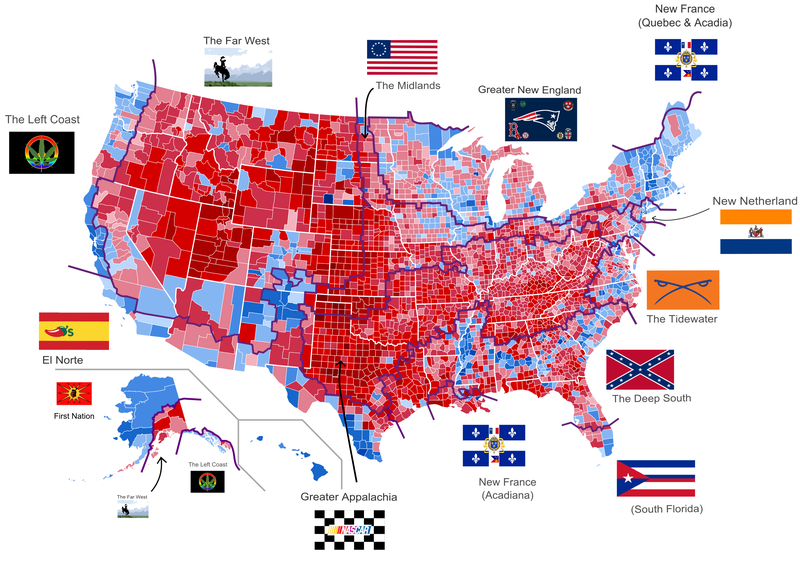 Maps can reveal patterns but they can also mislead. It looks to me as if the major Protestant religions are uniformly spread about. Maybe I’m wrong but if so how can you demonstrate that? And does one Protestant sect rather than another matter all that much. Here in Oakland the only religion I worry about is the Nation of Islam. I can’t imagine how being an Episcopalian rather than a Presbyterian would matter much. And yes I’ve read ‘Albion’s Seed’. Perhaps I just have a good eye for patterns. Do you think you would see them better if I overlayed the maps with Colin Woodard’s divisions? The pattern is much stronger for some religions than others. It’s fairly strong for the Congregationalists and a little less strong for the Quakers. Indeed, it is weaker for the Anglicans and the Presbyterians. The Pentecostals do indeed strongly follow the Scotch-Irish settlements across Greater Appalachia and in the West. Quite true. This is why I didn’t pay much attention to Alaska. And does one Protestant sect rather than another matter all that much….I can’t imagine how being an Episcopalian rather than a Presbyterian would matter much. As explained in the post, the different religions are reflections of the mindsets of their adherents. It today’s world, awash in local churches and much more secular than in the past, it means less than it once did. One might suspect that this would lead to no discernible patterns to religious distribution. However (contra your objections), there are patterns, which is interesting. I’m hardly saying that these particular religious distributions are of enormous consequence, but I am noting their connection to the American nations as Woodard has drawn them. The Quaker map seems a bit questionable. There are essentially two Quaker religions, the pastoral and the silent-meeting. The latter are more widespread though perhaps less numerous, the former are limited to the Midwest (and a bunch of Kenyans they converted.) The pastoral, programmed or evangelical “Quakers” aren’t really considered proper Quakers by the predominant liberal, silent-meeting type. To give some idea of the depth of the split, in the ’20s the pastoral type were associated with the KKK, while the silent-meeting type had been leaders of the Underground Railroad. The silent meeting Quakers are the ones that are associated with the major US cities and most of the Quaker schools. They are not noticeably Christian, indeed Jesus or the Bible are hardly ever mentioned, and it is considered gauche to bring them up. (Anyone may speak in the “silent” meetings.) Virtually all of them are converts (“convinced” Friends, rather than “birthright”); the sect had just about died out when the Vietnam War and the automatic conscientious objectorship that being a member of a meeting offered caused a huge influx of boomers. Today the silent-meeting Quakers are ultra-liberal clubs, defined mostly by extreme political correctness. They also have a remarkable uniformity of personality type. At Pendle Hill, a silent-meeting study center near Philadelphia, 17 of 19 people taking the Myers-Briggs were INFPs, a type found in about 2% of the general population. (The other two were an INTJ and an INTP). They have had a disproportionate impact, however, being largely responsible for the first industrial revolution (iron made with coked coal instead of charcoal, railroads, iron rails, passenger rail, most early British mining, cast steel, iron ploughshares, interchangeable parts), as well as social innovations (schools for worker’s children, workhouses, commercial / small business banking, e.g. Barclay’s and Lloyds, fixed-price shops, the American type of nuclear family (see Albion’s Seed), abolitionism, anti-war activism) as well as a good deal of science (many early instrument makers, Quare, Tompion, funding of the Harrison chronometer, Dalton’s observationally-based atomic theory (when chemistry finally shed the last vestiges of alchemy), Young’s wave theory of light, the compound microscope, early pathology, antiseptics) and a few other odds and ends such as railway timetables, metal bridges, and milk chocolate. Arthur Eddington and Nobelist Joseph Taylor are the best-known Quaker physicists; Quakers were awarded the Nobel Peace Prize in 1946,1947 (to the Friends’ Service Committees, the only time the award went to religious organizations) and 1959. They also played a great role in the development of the US, founding Pennsylvania, designing the Conestoga wagon, and giving rise to such icons as Annie Oakley, Betsy Ross, Daniel Boone, Dolly Madison, and James Dean. “Here are various German sects (Mennonites and Amish), mostly confined to the Midlands:” Deutsch speaking Swiss. Swiss from Switzerland not German from Germany.